Disney On Ice – Rockin’ Ever After – The Language Debate? My family and I are Disney fans, hands down HUGE Disney fans. As a family, we take one trip every 5 years to Disney World in Florida. Our plan is to head Disney next year for our oldest daughter’s third trip, but that is 10 months away. To tide us over we (insert children squealing here) are very happy to announce we will be reviewing Disney on Ice Rockin’ Ever After at Scotiabank Place in Ottawa at the end of this month. Our only question is do we go to the French show or the English show? All three of my children are in French Immersion. They sing French songs, have complete conversations in French with their friends and watch French TV. But I am the problem. I have been learning conversational french since my oldest began French Emersion 4 years ago. Her teachers have been very patient with me and my broken Southern Ontario French accent and humored me as I stumbled through Parent Teacher Interviews. I don’t want to hold my three children back from enjoying themselves in both official languages. 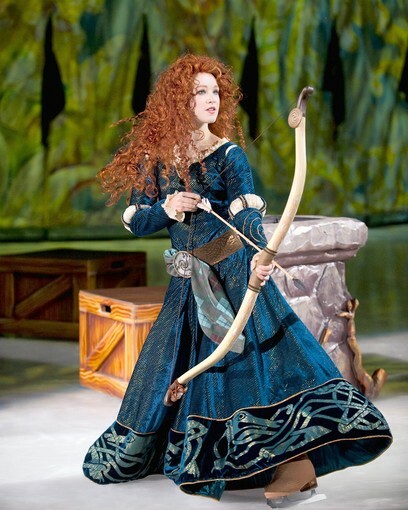 Whatever language we see Disney on Ice Rockin’ Ever After in the girls have decided they are most excited to see Merida. Andie explains, “Mom, Merida would fit in our family cause she’s got a little attitude just like me”. Well said Andie, well said. Do you have this dilemma? What would you do? Leave me a comment or advice please! Here are all the details and yes I will have tickets to give away in an upcoming post! Mickey and Minnie have searched the globe for the hippest and hottest acts to perform in the most sensational talent showcase to rock the ice in Ottawa in Disney On Ice presents Rockin’ Ever After.Tickets for this first-ever run of performances at Scotiabank Place are on sale now. In a new twist on fairytale fun, your favourite Disney characters compete to be the next superstar in comical segments leading up to the tales of show-stopping princesses – Ariel, Rapunzel, Belle and, in herice debut, Merida from Disney Pixar’s Brave. Produced by Feld Entertainment, Rockin’ Ever After remixes the stories of Disney’s most adventurous heroines with upbeat music and energetic choreography that will have audiences singing, dancing and cheering for their beloved Disney idols. Mickey and Minnie encounter the most talented performers in the land with an all-star lineup that includes Sebastian and the Daughters of Triton from The Little Mermaid, the rowdy pub thugs from Tangled and the spunky enchanted servants from Beauty and the Beast. The journey continues to the Scottish highlands, where audiences will be captivated and star struck by Merida, as an exhilarating archery contest ensues for the right to marry the fiery redhead. Tickets for Disney On Ice presents Rockin’ Ever After can be purchased by visiting www.CapitalTickets.ca, by phone at 613-599-FANS (3267) or 1-877-788-FANS (3267); in person at the Scotiabank Place box office. Tickets are $67.50 (rinkside seats), $52.50, $30, $23 and $15 for all shows. All tickets for opening night (excluding rinkside and VIP seats) are only $15. Prices include all taxes but exclude CRF and convenience charges. Wednesday, Feb. 27 – 7 p.m.
Thursday, Feb. 28 – 10:30 a.m. and 7 p.m.
Friday, March 1 – 7 p.m.
← Disney on Ice Rockin’ Ever After – The Language Debate? Hmmmm Same issue here as I did not grow up anywhere near Ottawa which truly is a bilingual city much more than our country being bilingual. That being said, my kids are growing up here and are bilingual yet I am not and have not plans to be. I still use my high school Latin and am currently learning beginner Italian. I say go in the language you can all enjoy OR use it as an extension of their French enrichment and see it in French. Either way it’s nice to have choices right?